The operating system will be developed by members of the Ubuntu community, along with staff from chip giant Intel. Its development was prompted by the growth of power hungry portable devices that place new demands on software. "It is clear that new types of device - small, handheld, graphical tablets which are Internet-enabled - are going to change the way we communicate and collaborate," said Ubuntu CTO Matt Zimmerman. "These devices place new demands on open-source software and require innovative graphical interfaces, improved power management and better responsiveness." 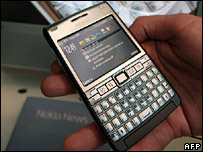 Mobile firms such as Nokia are already using open source technologies in some of its products. Ubuntu is already a popular choice of operating system on desktop and laptop computers. In contrast to offerings from companies such as Microsoft that earn money by licensing and charging for use of their products, Linux code is freely available. That means anyone can modify it or develop applications for it. As a result, there are many different types, or distributions, of Linux operating systems. The driving force behind the Ubuntu project is Mark Shuttleworth, one of the world's first space tourists. The self-made millionaire from South Africa founded the firm Canonical in 2004 to promote and support open source software projects. The firm's partnership with Intel to develop the mobile operating system is just the latest deal with some of the powerhouses of the technology world. In April this year, Ubuntu announced a deal with Dell, the world's second largest manufacturer of PCs, to offer certain computers with the operating system preinstalled. "We are delighted to be working with Intel on this version of Ubuntu," said Mr Zimmerman. "Intel is making significant contributions of technology, people and expertise to the project." The chip-maker has already shown off a device running a prototype of the Ubuntu mobile platform. At a recent meeting Intel CEO Paul Otellini held up a prototype device, like a large cell phone, running the system, although he said it was also capable of running versions of Microsoft's Windows. Intel is keen to grab a slice of the fast growing market for net-enabled phones and devices. It has already endorsed another open source project to develop applications for mobile devices known as the Gnome Mobile & Embedded Initiative (GMAE). The firm also recently unveiled plans for a tiny low-energy chip designed specifically for mobiles and portable computers. Codenamed Silverthorn, the chips will be one-seventh the size of conventional processors and consume just 10% of the power, Intel said. Hardware developments such as this are important to maximise battery life for portable devices that are required to run increasingly sophisticated software and deliver relatively power-hungry applications like the web. The new Ubuntu platform will also aim to maximise energy efficiency whilst offering a graphical interface designed specifically for the small screen. More details of the new operating system will be announced at the Ubuntu Developer Summit being held in Seville, Spain from 06 to 11 May. An initial version will be released in October this year.